For over 150 years the progressive decrease in accommodation with aging was thought to be a loss of lens flexibility often referred to as lens sclerosis. This theory was developed by the German scientist Helmholtz in 1855 and has been accepted as true until 1994. According to Helmholtz’s theory, when an individual focused his eye for near his ciliary muscle in the eye contracted and released tension on the lens ligaments allowing the lens to thicken. However, this theory was proved wrong in 1994 by an American scientist and ophthalmologist, Dr. Ronald Schachar, who holds both a Ph.D. in physics and a doctor of medicine degree. Thanks to Dr. Schachar, the errors in the Helmholtz theory were exposed and new applications found to reverse the loss of accommodation in the human eye. Dr. Schachar found that contrary to Helmholtz’s theory, there was no relaxation of the lens principal (equatorial) ligaments when accommodation occurred. Schachar showed that the equatorial fibers of the ciliary muscles pull directly on the ends of the lens and cause it to thicken, thus allowing one to see more closely. In fact, Schachar also found that the aging lens does not lose its elasticity due to sclerosis. The ability to accommodate is inherent even in an older eye. The principal problem appeared to be the growth of the eye with time. The human lens is like a tree and lays down new layers as we age. Thus the lens lengthens approximately 20 microns per year as we age. By the time we reach the age of 40 the lens has increased sufficiently in size so that the ciliary muscles are no longer taut in the eye and can no longer exert tension through the equatorial fibers of the lens when the ciliary muscle contracts for accommodation. For this reason, we lose our ability to accommodate at approximately the age of 40 and experience progressive loss of near vision as we get even older. Dr. Schachar theorized that presbyopia could be corrected if the ciliary muscles could be stretched a small amount to allow them to function on the lens. A number of procedures were worked out to accomplish this. 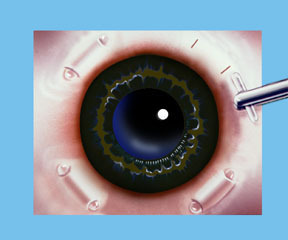 Relatively recently the Schachar Accommodative Scleral Implant (SASI) was developed. By making a small 4 mm long incision in the outer coat of the eye (the sclera), which is half thickness, we can place a small polymethyl methacrylate (PMMA) arched stent within this scleral tunnel which will exert a stretching effect on the equatorial lens fibers. Four of these are placed around the eye in the sclera (approximately 2 mm away from the cornea), and approximately 90 degrees apart. These stents allow rapid restoration of accommodation and have proved to show good function and effectiveness in those patients done to this date. Note: For illustration purposes, the conjunctiva (which normally covers the sclera) is not shown so that the scleral implants may be clearly seen. Once the procedure is complete the conjunctiva will cover the scleral implants making them virtually invisible. Further uses for the Schachar Accommodative Scleral Implant may be to reverse glaucoma. Simple open-angle glaucoma (the type that most individuals have) usually begins at about 40 and increases in severity with age. Dr. Schachar theorizes that this glaucoma is directly linked to the growth of the lens and the inability of the anterior and posterior ciliary fibers to open the trabecular meshwork and allow the drainage of intraocular fluid from the anterior segment of the eye. In those glaucoma patients who have been operated on intraocular pressures have dropped amazingly with the implantation of the Schachar Accommodative Scleral Implant (SASI). Who knows the future uses for this Schachar scleral implant! It may be that the onset of cataracts is also in some way related to the loss of accommodation and the pumping effect on the lens which may remove metabolic waste products from within it. The human lens has no blood vessels and it is possible that the transport of substances in and out of the normal human lens is aided by the pumping effect of the accommodation. Another theory may involve stretching of the lens protein by accommodation which may keep the lens healthy. At any rate, only future research will allow us to know whether or not cataracts may also be prevented by the Schachar Accommodative Scleral Implant (SASI). (Paper to be published in Ophthalmosurgery Journal, Moscow, Russia) THE SURGICAL CONQUEST OF PRESBYOPIA; ARE THERE IMPLICATIONS FOR CATARACT AND GLAUCOMA? 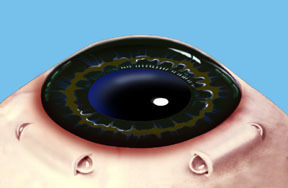 This century has seen a revolution in the surgical treatment of ophthalmic disorders ranging from corneal transplantation, cataract extraction, phacoemulsification of the lens, intraocular lens implantation, radial keratotomy, excimer laser ablation of the cornea, vitrectomy, and the surgical treatment of retinal detachment. It is appropriate that this tenth anniversary edition of Ophthalmosurgery include a brief discussion of accommodation and the surgical reversal of presbyopia. This is the last great frontier that, until this decade, has defied correction. Recent investigative work by Dr. Ronald A. Schachar has elucidated many previously misunderstood aspects of accommodation and given rise to a new surgical procedure which holds promise not only for the reversal of presbyopia but possibly for the prevention of chronic open angle glaucoma and cataract. The Helmholtz hypothesis holds that in distance vision the ciliary muscle is relaxed and the zonules of the lens are under relative tension. With accommodation the ciliary muscle contracts relieving tension on the zonules (see Fig. 1). This allows the elasticity of the lens capsule to induce a resultant increase in the equatorial diameter of the lens, accompanied by decreased radius of curvature of both the anterior and posterior lens surfaces. The hypothesized result is an increase in central thickness of the lens. Helmholtz explains presbyopia as a loss of elasticity in the lens capsule combined with sclerosis of the lens with aging. If this hypothesis were true then lens hardness should increase in a predictable fashion dependant upon age. Also with the zonules relaxed in accommodation, the lens should be unstable. If one is looking down and accommodates, gravity should pull the lens forward and increase the near point of accommodation. A decrease in gravity, such as experienced in outer space or in an orbiting space station would theoretically decrease the near point of accommodation in downgaze and result in a decreased ability to accommodate and visualize near objects. Spherical aberration, which is evaluated by comparing the focal points of central and peripheral light rays striking the lens, should also increase with accommodation. In addition, the Helmholtz theory would predict a myopic shift with age as the lens becomes sclerotic and thickens. In reality, there is a hyperopic shift in the vision with age. Recent experimental evidence tends to contradict many of the phenomena predicted by the Helmholtz theory. In actuality, experiments done in the orbiting space station have shown no loss in accommodation without gravity when looking down. In addition, Dr. Schachar has placed subjects on a rotating neurosurgical bed, which can be positioned so that the patient can be rotated with the head facing directly downward. Helmholtz postulates that with accommodation the tension on the lens zonules decreases. Therefore, if the zonules are relaxed and the subject placed in a prone position, the lens should move forward by the effect of gravity. Meticulous measurements have failed to reveal an increase in the ability to accommodate with the head downward in a prone position. Similarly, investigation has failed to show an increase in spherical aberration with accommodation. In fact, the opposite has been shown. Although lens hardness does increase with age it does not increase in a predictable manner. The onset of presbyopia and the loss of accommodation is a very predictable phenomenon which occurs in 100% of the population at the exact same time plus or minus one and half years (see Fig. 2). If Helmholtz were correct, then lens hardness should increase in a relatively predictable fashion as would be expected from the shape of the accommodation curve. This is not the case. Similarly, there is a moderate hyperopic shift in the human eye with age that cannot be explained by the Helmholtz theory. As emphasized by Schachar, almost no muscle in the body produces its effect indirectly by inducing relaxation. In nature, muscular effect is always the direct result of a muscular contraction transmitted through a tendon. Helmholtz postulates that during accommodation, when the optical power of the eye is greatest, the zonules are relaxed. He further states that the zonular relaxation is the result of ciliary muscle contraction. If this were the case then the lens position would not be stable while reading or examining close objects and would be affected by gravity depending upon position. The Schachar hypothesis holds that the lens is under constant tension. Accommodation is accompanied by a contracted ciliary muscle causing increased tension on the equatorial lens zonules. This induces peripheral flattening of the lens and secondary steepening of the anterior and posterior central curvatures (see Fig. 3). Since the lens curvature steepens centrally and flattens peripherally, the asphericity of the lens increases with accommodation. This has been shown to occur clinically. The effect could be compared to a balloon filled with a fluid medium. If the periphery of the balloon is stretched, then the fluid will be pushed towards the center and cause a resultant thickening of the anterior posterior diameter of the balloon (lens), causing a steepening of its central curvatures. Schachar further postulates that only the equatorial lens fibers contract during accommodation. The anterior and posterior zonules appear to serve a different function than the equatorial zonules. As the lens accommodates, these in fact relax. It is the relaxation of the anterior and posterior fibers that tend to stabilize the position of the lens during accommodation. With enlargement of the lens during old age, it is prevented from moving forward or changing position during relaxation of accommodation. 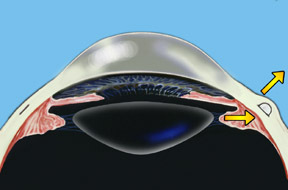 Thus the anterior and posterior zonules appear to have a passive supportive affect on the lens in regard to its position, and the equatorial zonules, which have a separate insertion into the ciliary body, are the causative factor in accommodation. Interestingly, with age the lens increases in diameter in the equatorial region by approximately 20 microns per year (see Fig. 4). Like hair, nails, and skin, which are also ectodermal, there is constant growth throughout life. This growth at the lens equator decreases the distance between the lens and the ciliary body causing laxity in the zonules which limits the ability of the ciliary muscle to exert an effect on the zonules by the time one approaches 45 years of age. Similarly, Schachar has emphasized that with age the anterior and posterior lens zonules increase in distance from the lens equator and therefore enhance lens stability as the lens equator enlarges with increasing age. Because the ciliary muscle is attached to the scleral spur and to the trabecular meshwork, the muscle must apply some force to the trabecular meshwork as well. This force is related in a linear fashion to the amount that the ciliary muscle is stretched. With normal equatorial lens growth the ciliary muscle exerts a decreased force on the trabecular meshwork. This may help to explain the decrease in outflow facility observed with increased age and the increased incidence of chronic open angle glaucoma from age 45 onward. Another interesting postulation relates to the pathology of cataract formation. Since the lens receives no blood supply, nutrients must enter the lens from the aqueous fluid and similarly the waste products of metabolism exit the lens into the same fluid. With the loss of the pumping action of accommodation it is possible that there is a buildup in the concentration of metabolic waste products within the lens. Also there may be inhibition to the inflow of metabolites into the lens structure. In addition, a disuse atrophy of lens protein may occur as accommodation decreases. If it were possible to reverse presbyopia and restore accommodation then the incidence of senile cataract might decrease. Only time will prove or disprove this postulation. The veracity of the Schachar theory of accommodation is substantiated by physiologic facts that shows a variability in the increase in lens hardness with age. This is not consistent with the continuous and predictable loss of accommodation that one sees in the accommodative curve. Also, the human optical system experiences a slight hyperopic shift with aging which is not explained by the Helmholtz theory. In contradiction to Helmholtz, experiments by Schachar and others have shown that spherical aberration decreases with accommodation due to an increased asphericity in the lens. Only the Schachar hypothesis of accommodation holds true when one looks at actual observations concerning aspherical aberration hyperopic shift with age, the effect of gravity on accommodation and lens hardness (see Fig. 5). From the Schachar hypothesis of accommodation it could be deduced that if one were able to increase the distance between the lens equator and the ciliary muscle, one could again put the zonules on stretch and reverse the effect of lens growth, which occurs throughout life and tends to narrow this distance (see Fig. 6&7). Schachar first attempted to do this by placing a continuous band around the eye approximately 1.50 mm behind the surgical limbus. However, untoward side effects resulted in some cases due to interference with the blood supply that accompanies the long ciliary vessels forward about the location of the four recti muscles. In order to avoid ocular ischemia and/or secondary glaucoma, Schachar changed the procedure approximately two years ago so that instead of a continuous band, four arched 4.0 mm implants were implanted in a scleral tunnel. The design of these implants, which have a 9.0 mm radius of curvature, was such as to stretch the sclera over the location of the implant and to thereby increase the distance between the ciliary body and the lens to allow increased accommodation. The implants were placed approximately 2.0 mm posterior to the surgical limbus and located at 45 degrees, 135 degrees, 225 degrees, and 315 degrees so as to avoid the ciliary vessels. However, difficulty in maintaining the stability of implant, which tended to rotate because of its rounded foot plates, led to a change in the implant design which was lengthened from 4.0 mm to 4.5 mm (see Fig. 8). The shape was altered so as to flatten the foot plates located at either end of the implant to inhibit rotation. Later, Schachar deduced from mathematical calculations that an increased surgical result could be obtained if the implant were placed 2.75 mm posterior to the surgical limbus instead of the previous distance of 2.0 mm. The postoperative appearance of the implants appears excellent and they are well tolerated (see Fig. 9). There are few surgical contraindictions to the procedure (see Fig. 10). To date, surgeons around the world including those in the United States, Canada, and France have begun aggressive implantation of the Schachar intrascleral stint in an effort to reverse presbyopia. Because of regulations in the United States imposed by the U.S. Food and Drug Administration several U.S. surgeons, including myself, have elected to perform these procedures in Mexico. Surgeons in Canada and France have been free to aggressively implant the device in their own countries. My personal experience has been limited to a small number of cases at this point. However, the new design appears to increase accommodation by between 4 and 6 diopters with the placement of the newer 4.5 mm stint located at the previously noted meridians 2.75 mm behind the surgical limbus. Dr. Eugene Zdenek in Los Angeles and other noted surgeons have verified this effect as well. The change in design of the implant may precede further changes in the future. This is an evolving surgical procedure whose ultimate optimization has yet to be determined. However, the possibilities that might accompany the surgical reversal of presbyopia, which might include the treatment of chronic simple glaucoma and the prevention of cataract, are exciting. It will be interesting to look at this procedure ten years from now with the publication of the 20th anniversary edition of Ophthalmosurgery. Brown N. Shape of lens equator. Exp Eye Res. 1974; 19:571-576. Brown N. The change in shape and internal form of the lens of the eye on accommodation. Exp Eye Res. 1973; 15:441-459. Donders FC. On the Anomalies of Accommodation and Refraction of the Eye. London: The New Sydenham Society; 1864:204-214. Duke-Elder S, Gloster J. Weale RA. The philosophy of the eye and of vision. In: Duke-Elder S, ed. System of Ophthalmology. Vol. 4. London: Henry Kimpton; 1968:617-619. Farnsworth PN, Burke P: Three-dimensional architecture of the suspensory apparatus of the lens of the rhesus monkey. Exp Eye Res. 1977; 25:563-576. Farnsworth PN, Shyne SE: Anterior zonular shifts with age. Exp Eye Res. 1979; 28:291-297. Fisher RFJ; Presbyopia and the changes with age in the human crystalline lens. J Physial (Lond). 1973; 228:765-779. Ivanoff A. On the influence of accommodation on spherical aberration in the human eye: an attempt to interrupt night myopia. J Opt Soc Amer. 1947; 37:730-731. Kaufman PL, Rohen JW, Barany EH. Hyperopia and loss of accommodation following ciliary muscle disinsertion in the cynomolgus monkey: physiologic and scanning microscopic studies. Invest Ophthalmol Vis Sci. 1979; 18:665-673. Koomen M. Tousey R, Scolnik R. The spherical aberration of the eye. J Opt Soc Amer. 1949; 39:370-376. Kaczurowski MI: Zonular fibers of the human eye. Am Ophthalmol. 1964; 58:1030-1047. Podgor MJ, Leske MC, Ederer P: Incidence estimates for lens changes, macular changes, open-angle changes, open-angle glaucoma and diabetic retinopathy. Am J Epidemiol. 1983; 118:206-212. Saunders H. A longitudinal study of the age-dependence of human ocular refraction: age-dependent changes in the equivalent sphere. Ophthalmic Physiol Opt. 1986; 6:39-46. Schachar RA, Anderson DA. The mechanism of ciliary muscle function. Ann Ophthalmol. 1995; 27:126-132. Schachar RA. Cause and treatment of presbyopia with a method for increasing the amplitude of accommodation. Ann Ophthalmol. 1992; 24:445-452. Schachar RA, Cudmore DP. The effect of gravity on the amplitude of accommodation. Ann Ophthalmol. 1994; 26:65-70. Schachar RA, Cudmore DP, Torti R. Black TD, Huang T: A physical model demonstrating Schachar’s hypothesis of accommodation. Ann Ophthalmol. 1994; 26:4-9. Schachar RA. Histology of the ciliary muscle-zonular connections. Ann Ophthalmol. 1996; 28:70-79. Schachar RA, Huang T. Huang X: Mathematic proof of Schachar’s hypothesis of accommodation. Ann Ophthalmol. 1993; 25:404-409. Schachar RA. Zonular Function: A new hypothesis with clinical implications. Ann Ophthalmol. 1994; 26:36-38. Tscherning M. Physiological Optics. Philadelphia, Pa; Keystone; 1904:160-189. Vanderploeg JM. Near visual acuity measurements of space shuttle crew members. Aviat Space Environ Med. 1985; 57:492.
von Helmholtz H. Physiological Optics, 3rd ed. NewYork, Dover, 1962; vol 1: 143-172, 334-415.
von Helmholtz H. Uber die akkommodation des auges. Albrecht von Graefef Arch Ophthalmol, 1855; 1:1-89.